218 pages, 5.5" x 8.5"
One of the greatest books ever written on practical survival is back in print for the next generation of self-reliant citizens! Mel Tappan was the godfather of the modern preparedness movement, and this classic collection of his writings is an indispensable resource for information on how to develop a survival mind-set, identify the best survival locations, store food, maintain communications, select firearms and much more. A new foreword by Bruce Clayton, himself an important figure in the preparedness movement after the publication of his book Life After Doomsday in 1980, describes the unique appeal of Tappan's writings and personality, puts Tappan's role in the survivalist movement in historical perspective and explains why his work is still highly relevant today. 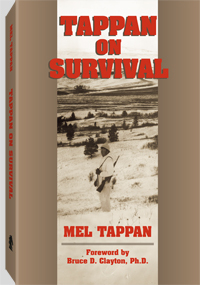 Mel Tappan was a survival consultant, freelance writer, lecturer, and survival editor of Soldier of Fortune magazine. His interest in firearms began at the age of 6 when he received his first .22 rifle. From that time, he was an avid shooter, student of weaponry, and outdoorsman. He was devoted to evaluating firearms, outdoor and survival equipment, storable foods, and communications devices in order to provide assistance, by means of his writings and public lectures, to people who see the value of self-sufficient living and long-term survival planning.